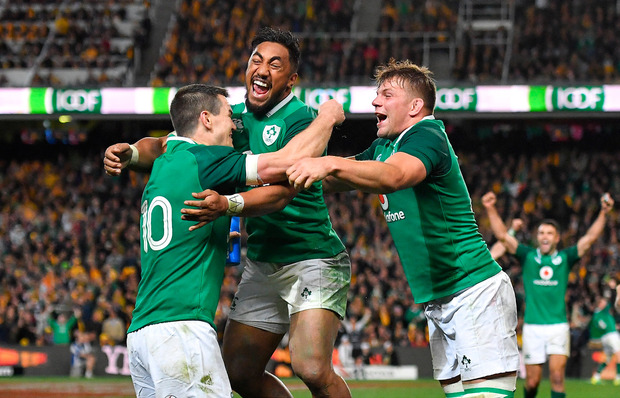 Here is how the Ireland players rated in the dramatic 20-16 win over Australia in Sydney that clinched the test series. In the wars from early on, but soldiered through the pain barrier with a commanding display in the air and some good counter-attacking. Foot in touch might have been costly, but overall a strong performance. The players’ player of the season kept going until the death. This wasn’t a night for any of his glamorous stuff, but Earls rolls up his sleeves with the best of them and kept coming back for more. Defensively excellent and had some good moments in attack as well. Having missed out on Twickenham, he’s been able to finish an interrupted campaign with some big days and he put the first Test struggles behind him. On a night when Ireland’s physicality won the day, it was Connacht’s Aki who set the tone with a relentless effort in defence and attack. Looked to be fading, but got a second wind and finished strong. An unfortunate yellow card might have turned red at the death had the referee adjudged a deliberate knock-on, but that was a desperate effort at the end of a determined performance. How he finished the game is a miracle after taking so much treatment from the Australians. He always comes back for more and he came up trumps at the death with a superb penalty. Decision-making was on point. So consistent, he rarely looks flustered and while those around him were visibly tiring he continued to organise and tackle hard when required. Never stopped working or took a backwards step. The loosehead prop’s 50th cap was as consistent as ever as he scrummaged well and tackled his heart out, hit countless rucks and carried willingly when asked to do so before Cian Healy came into the fray. An eleventh hour call up for Sean Cronin, he endured a troubled time out of touch early on but kept his cool to deliver good possession for his side. Worked hard in the loose and scrummaged well. No one deserves a summer holiday more. Still tackling athletic backs after more than an hour of this long and superb campaign. His impact with the ball was excellent once again as he propelled his team forward. Finishes the season in excellent form and is right in the mix for a starting spot next November. Worked with Scannell to fix the lineout and he carried well, tackled hard and was still going at the end. Faded a little as the second-half went on, but remained a willing carrier and tackler as he worked his socks off to conclude a sensational breakthrough year with another big performance and scalp. Follow that. The official man of the match revelled in his return to the blindside with a hugely physical effort which he capped with a maul try. Switched to No 8 and kept the show on the road. His bravery cost him his place as he was upended climbing high to take on Israel Folau and came crashing down for the third time. A big turnover set the tone but Jordi Murphy did well when called on early. Justified his selection with a big performance, particularly in defence where he led the tackle count and put in some crucial efforts. Carried well and ran himself into the ground before making way for an energetic Tadhg Beirne. He will reflect with huge pride on this campaign and with so much enforced changes and the delay in getting to the ground he will be delighted with how his team dug in and fought to the bitter end.